Hortus Camdenensis | Hippeastrum reginae (L.) Herb. Variable spring or summer flowering bulbous perennial with strap-shaped leaves and up to 4 funnel-shaped, drooping, bright red flowers with a large green-white stain in the throat, the lobes to 13cm across, on a stem to 50cm long. The leaves emerge after the flowers. To 50cm. [RHSE, Hortus, Baker Am.]. First botanically described by Linnaeus in 1759 as Amaryllis reginae [Syst. Nat. ed. 10, vol.22, p.977/1759]. 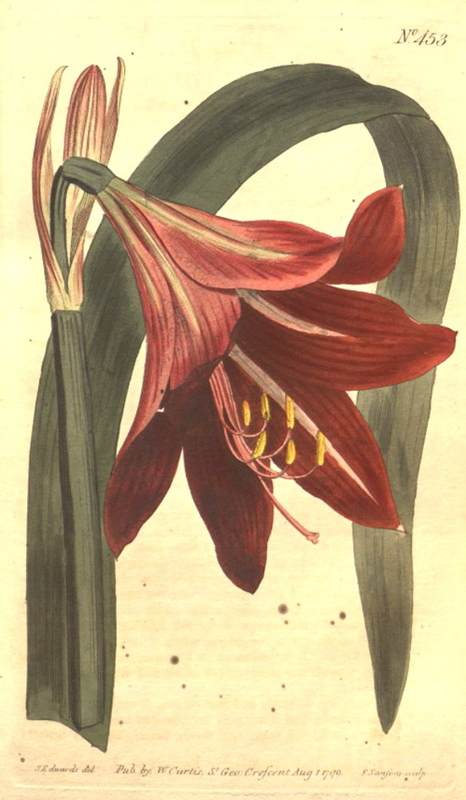 Placed in Hippeastrum by William Herbert in 1821 [Herbert’s Appendix p.31/1821]. Introduced to Britain in 1725, it was named for Queen Caroline, wife of George II. [JD]. ‘Dr. James Douglass […] gave it the title of Lilium Reginae, because it is in full beauty on the first of March, which was the late Queen’s birthday.’ [From Miller’s Dictionary, quoted in BM t.453/1799]. Andrews' Botanical Repository figured Amaryllis brasiliensis: ‘This fine lily, from the Brazils, can scarcely be thought more than a variety of A. reginae; of which plant, both this and the A. equestris of Mr. Curtis, may be referred without much flexion of the original species.’ Amaryllis brasiliensis was introduced by the Marchioness of Bute from Spain in 1798. [ABR pl.358/c.1803]. The plant figured in Loddiges’ Botanical Cabinet as Amaryllis spectabilis, ‘ranked between vittata and reginae’, although depicted with pink flowers is also a form of H. reginae. [LBC no.159/1818]. This plant was also figured in Andrews' Botanical Repository [ABR pl.390/c.1804]. Listed in all published catalogues [B.218/1843]. Macarthur included Amaryllis (Hippeastrum) spectabilis among desiderata to Loddiges’ Nursery, 6th January 1845, together with Amaryllis (Hippeastrum) reginae. [MP A2933-2, p.28].